I slipped my hands into my jacket pockets and stepped out into the cool, not-quite-wintry February afternoon. It was a pleasant Thursday on the University of Memphis Lambuth campus, and I was in need of a good walk among the trees before I began my afternoon Spanish class. Ever since I can remember, nature has always been an escape for me. Back at Jackson State Community College, whenever I became upset or overwhelmed, I would take a walk down to the lake and watch the ducks go about their day just so I could forget my frustrations. There was something comforting in watching them sail around the slowly moving waters, swimming in peace. As a child, nature was the one thing that brought out my adventurous side. I eagerly jumped at any trip that involved being outside, from canoeing for the first time with my sixth grade class back in Ohio to walking the trail at Pinson Mounds with my family here in Madison County. I suppose it’s the openness of the outdoors that seems to present some sort of freedom from the enclosed spaces of the mind. I find it to be a wonderful destressor, and I think many would agree. While on the Lambuth campus, I often take these little detours before class to clear my mind of the day’s clutter. I let my feet take me where they want, let the wind whip past me, taking with it any frustrations that have piled up over the last few hours. Recently during one of my walks, I noticed that most of the campus trees have small, blue plaques attached to their trunks. I was curious to know what the labels meant and why they were there. Sometime later, I found that Lambuth’s array of trees make up what’s called an arboretum. An arboretum is defined as an area of land that houses a large variety of trees that’s prepared to be used educationally or scientifically, and even just to showcase the beauty of trees. 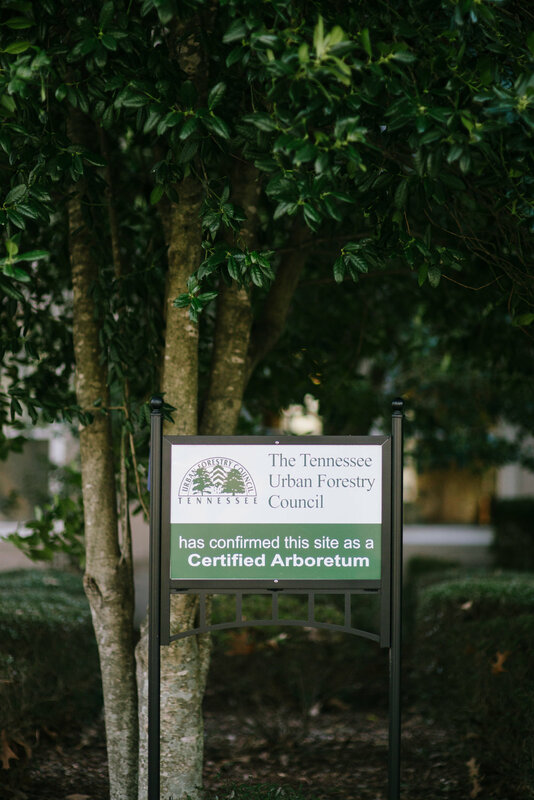 On September 4, 2015, the Tennessee Urban Forestry Council named the Lambuth campus a Level 2 Arboretum, a title only twenty-one other arboretums share all of Tennessee. Currently, there are sixty-four labeled trees on Lambuth’s grounds, maintained for public access. Somehow knowing the names of the trees makes my walk even more special, as if the trees and I share a friendship. Even if you’re not an outdoors person, it’s still worth a look, especially during the spring when everything is in bloom. Perhaps places like these can remind us all of the sacredness of a moment spent beneath a canopy of leaves, just a small glimpse at nature’s smile. The University of Memphis Lambuth is located at 705 Lambuth Boulevard. Learn more about the arboretum here. Cari Griffith Cari Griffith is a photographer by trade who loves storytelling of all kinds. After a couple of years away in Nashville, she and her husband Rob decided Jackson was calling them home, and they moved back to their beloved Lambuth area neighborhood. Cari's other loves include gardening, cooking, sharing meals with her friends, and trying to talk Rob into getting a dog. Originally from Murfreesboro, Tennessee, illustrator Katie Howerton moved to Jackson in 2011 to study Graphic Design and Drawing at Union University. She discovered Our Jackson Home in January 2015 and used it as a guinea pig for her senior design project, creating the first issue of Our Jackson Home: The Magazine. After graduating she was given leadership over Our Jackson Home at theCO, where she now runs the blog, designs the magazine, and coordinates events. She and her husband Jordan live in Midtown and are active members of City Fellowship Baptist Church.